Leading Exporter of Rose Quartz Silver Pendant, Lapis Stone Silver Pendant, Black Onyx Silver Pendent, Red Coral Silver Pendant, Rainbow Moonstone Silver Pendant and Jade Sterling Silver Pendant from Jaipur. 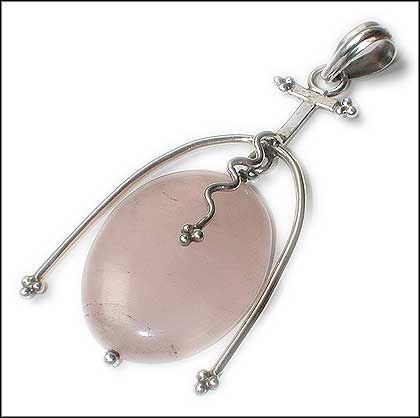 We are engaged in offering a quality assured assortment of Rose Quartz Silver Pendant. The Rose Quartz Silver Pendant we offer is widely demanded amongst the clients for its fine sheen and unique appearance. Offered products are designed accordingly as per the requirements of the clients. Owing to years of experience, we are presenting a quality assured assortment of Lapis Stone Silver Pendant. The Lapis Stone Silver Pendant we offer is designed beautifully and known for its fine sheen. Offered products are highly demanded amongst the clients, as they are available in plethora of sizes and designs that can be personalized to meet specific requirements of the clients. A tremendous collection of Black Onyx Silver Pendent is offered from our end. Black Onyx Silver Pendent is available in various sizes and designs. Known for their unique appearance and fine sheen our products are highly demanded by the clients. Besides, offered products are suitable to enhance the appearance of wearer. Backed by the team of skilled designers, we are presenting a quality approved array of Red Coral Silver Pendant. The Red Coral Silver Pendant we offer is widely demanded amongst the clients for its availability in various sizes and designs. Besides, offered products can be worn with Indian as well as western attire.